Minority Business Opportunity Day is an institution in Los Angeles. Always highly anticipated, MBOD brings together more corporate members, minority business enterprises, expert speakers and sponsors than any other single SCMSDC event of the year. They're problem solvers, bringing innovative and cost-effective solutions. Nimble and flexible, they respond quickly to customer requests. They add value and get things done. These are the hallmarks of entrepreneurs at their best, and on July 18, you can meet these elite suppliers who are competing for prestigious local SCMSDC Supplier of the Year awards. Sponsored by American Honda Motor Co. for the 29th straight year, the annual celebration recognizes top-performing minority business enterprises (MBEs) for their outstanding partnerships with corporate members. The Leadership Excellence Awards Dinner Gala is the high point of the year. Always an elegant evening, it is the night we honor the change makers among us: in business, public office, diversity and inclusion. And we always do it in style. The event actually encompasses two awards, the Leadership Excellence Award (LEA), and the MBE Input Committee-hosted Corporation of the Year Award (COTY). For business owners, time is money and they need real information they can put into action ... today. 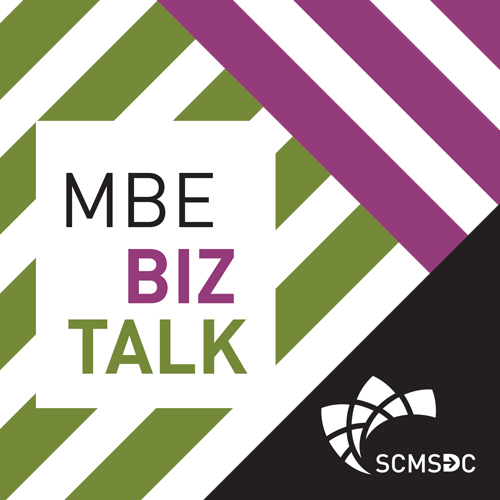 Each episode of MBE BizTalk features an in-depth conversation with a subject matter expert who'll help you get a new, no-nonsense perspective on an important topic that can impact how you run, grow and scale your business. Sponsored by a certified minority business, the MBE 2 MBE Open House is specifically designed to provide an environment for MBEs to network and get to know each other, as well as meet select corporate members who are also invited to attend. Logistically, our objective is to hold these events in different geographic areas in our region to better reach SCMSDC’s far-flung base of certified MBEs. Philosophically, our goal is to build a greater sense of community among our MBEs and to even create opportunities for them to do business with and learn from each other. The CEO Academy is a leadership and business development cohort for thriving MBEs in the SCMSDC network. This nine-month program brings together executive masterminds to help grow their capacities and capabilities while also increasing wealth creation and establishing strong strategic partnerships across diverse industries. Upon completion of this program, participants share academy outcomes and business impact with the SCMSDC Board and the Wells Fargo Leadership. The Pre-Certification Workshop is held once a month and provides a comprehensive overview of the application process, including required documents and eligibility. Attendees will also meet the team that will be handling their application. In 2017, there were 430 registered attendees for this workshop. The MBE Orientation is a monthly program for MBEs already certified or in the process of becoming certified. At this program, MBEs learn about the value of their certification and how best to leverage it to reach their business goals.